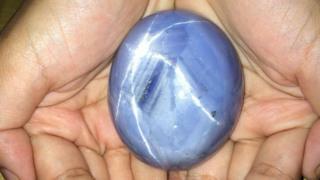 Gemologists in Sri Lanka claim that the largest blue star sapphire yet has been discovered in a mine in the country. The gemology institute in the capital Colombo has certified that the gem weighs 1404.49 carats and say they have not certified anything larger. The gem is valued at at least $100m and the current owner estimates that it could sell for up to $175m at auction. Sri Lanka's gem industry, for which sapphire is the main export, is worth at least £70m ($103m) annually. Blue star sapphires are so named because of the distinctive mark found at their centre. "The moment I saw it, I decided to buy," the current owner, who wishes to remain anonymous, told the BBC World Service's Newsday programme. "When the stone was brought to me I suspected that it might be the world's largest blue star sapphire. So I took a risk and bought it." The owner said it was "absolutely confidential" how much he paid for it. The previous record holder weighed 1,395 carats. The new gem was mined in the city of Ratnapura, in southern Sri Lanka, which is known as the City of Gems. It has been named the The Star of Adam by its current owner, after a Muslim belief that Adam arrived in Sri Lanka after being sent away from the Garden of Eden. It is claimed he then lived on the slopes of a mountain now known as Adam's Peak. The owner of the Star of Adam said he bought it thinking "this was not a piece of jewellery but an exhibition piece". Speaking to the BBC, Armil Samoon, a leading gem and jewellery dealer in Sri Lanka, confirmed this was the largest blue star sapphire in the world. A 17kg (2st 9lb) rock containing sapphires was revealed in 2013, but the final weight of the gems inside is not yet known. Sri Lanka's Gem and Jewellery Association said in 2011 that the engagement ring for Catherine Middleton, the Duchess of Cambridge, included a sapphire mined in the country in the 1970s. It was previously owned by Diana, Princess of Wales.